Everyone knows it's hard to talk about fiscal responsibility without referring to a slave ship with President Obama at the helm. OK, so that's not true at all. But it is the bizarre approach a Republican congressional candidate has chosen to communicate his campaign's message. Mark Oxner, a Republican congressional candidate from Florida, released a 39-second spot this week depicting the Obama administration as a slave ship. The video features several men and woman on a boat — "The U.S.S. Obamaship" — discussing how "this ship" has given them various benefits, such as a bank bailout and "free health care for life." 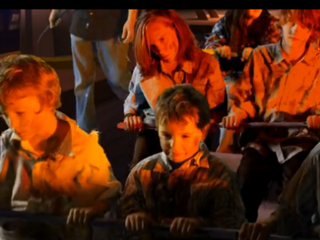 The video also includes shots of children rowing the boat while a man holding a whip watches closely. Not-so-subtle subtext: "African-American people may have come here on ships, but now things have changed, and this black president is trying to enslave your children with all his crazy policies. Vote for me." Unfortunately, we're not expecting emancipation from this type of transparent effort to harness racial anxiety anytime in the near future.